Who thought that inspiration for St. Patrick’s Day would come from La Tortilla Factory? 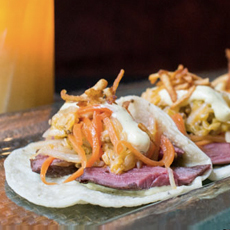 Corned beef and cabbage tacos! Should we serve them with mustard, or with tomatillo salsa? The answer to this question and others concerning nouvelle tacos can be found in the new book, The Taco Revolution by Brandon Schultz. The book covers both traditional and new recipes, with chapters for beef, chicken, fish, pork, vegetable, breakfast and specialty tacos, plus sides, sauces and taco party advice. Tacos for St. Patrick’s Day. Photo courtesy La Tortilla Factory. Salivating or simply intrigued? Get your copy at Amazon.com in hardcover or Kindle editions.